This card can be used to Ritual Summon any “Chaos” or “Black Luster Soldier” Ritual Monster. You must also Tribute monsters from your hand or field and/or banish “Blue-Eyes White Dragon” or “Dark Magician” from your GY, whose total Levels exactly equal the Level of the “Chaos” or “Black Luster Soldier” Ritual Monster you Ritual Summon. 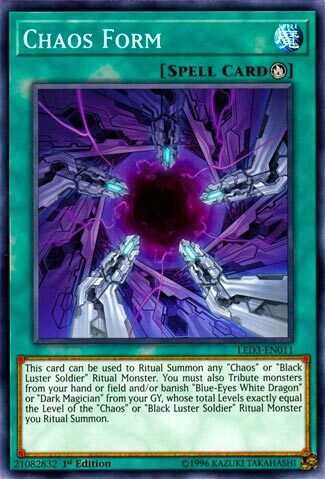 The first Throwback Thursday of the month and it’s going to Blue-Eyes, I considered Chaos MAX for this spot but it is very similar to Chaos Dragon with the protection and only has double piercing, so I thought the Ritual Spell would be more interesting, Chaos Form. Chaos Form is a Ritual Spell that lets you Ritual Summon any Chaos or Black Luster Solider Ritual from your hand by tributing monsters whose Levels exactly equal the Level of the Ritual, but you can also banisher Blue-Eyes White Dragon or Dark Magician from the GY to meet some of the requirements, though I don’t know how much you want to banish your Blue-Eyes White Dragons or Dark Magicians. As far as I know, all the Chaos/Black Luster Soldier Rituals are Level 8, so Dark Magician won’t fit the criteria by itself and it sadly does not have its own Chaos Ritual yet, so the case you’ll most likely to banish a monster with this is using Blue-Eyes White Dragon to summon a Chaos Ritual since I don’t think Black Luster Solider and Blue-Eyes mix well as a deck as of this moment. Some negatives of this card is that it does not list a specific Ritual Monster (the Black Luster Soldier part includes the original and Super Soldier, so it isn’t really specifically listing Black Luster Soldier) therefore this card does not work with Pre-Preparation of Rites, but the Impcantation monsters make up for that. Another negative is that you need exact Levels, which most Ritual Spells that let you summon multiple different Rituals do, but can be inconvinent is some instances and you can’t use Impcantation Talismandra and Candoll together, but Manju and Candoll work and Impcantation will get a Level 3 and 5 to help out. Chaos Form is a decent Ritual Spell and is more searchable now with another card that will be reviewed soon. Art: 2.5/5 Not really that impressed here, don’t know what’s going on to be honest. I’ve seen much better Ritual Spell arts. Chaos Form has gotten more targets as of late, but it is still a Ritual Spell. Any “Chaos” or “Black Luster Soldier” Ritual Monster is available for this card to summon, which lends to utility if you are running a deck with a few of them. It now has five targets, with Chaos MAX Dragon being the best out of all of them, however the new Blue Eyes Chaos Dragon comes in at a close second. The hand, field, and grave are available for monsters, making this ritual one of the better ones to play. It has an assortment of options to search it out, but it lacks a protection factor. If you could remove it from your grave to prevent a destruction then it would be so much better. A dedicated Ritual deck for this could hit hard and fast, but other then that, it’s just a Ritual Spell. Chaos form has a great name for a Ritual Spell. You can Ritual Summon any Chaos or Black Luster Soldier monster by tributing from your hand or field the exact Level of the monster you want to Ritual Summon. You can also banish Blue-Eyes White Dragon or Dark Magician from your grave. This includes anything acting like those cards in the grave, but I’m not sure which Dark Magician is Level 8 to summon any of the Black Luster Soldiers or Blue-Eyes Ritual Monsters. Chaos Form has many ways to search it from your deck, but the effect could have included a way to get itself out of the grave or something. Listing Dark Magician in the card text makes it even more searchable if not practical. I’m glad it’s not once per turn in case you draw multiple copies. Finally, the artwork is meh. Advanced Ritual Art is probably better overall. This is a fun and appropriate card for Throwback Thursday, given how we opened the week. Chaos Form is the Ritual Magic card that brings out the Ritual Chaos Blue Eyes Monsters. (Also can be used to Ritual Summon any Black Luster Soldier Ritual Monster, of which there are a handful of now). So what all does this entail exactly when using this card? You get to Tribute Monsters from your Hand or Field but you are also awarded the ability to remove from play Blue Eyes White Dragon or Dark Magician form your Graveyard…this is great, as you have many options as to what you can remove/Tribute and where these resources can come from. Which helps to make these Rituals that much more playable as well. The Levels obviously have to equal what you Summon. Not much else to say here, if you’re playing those cards in your Deck, you’re going to be using this, and it’s versatile, and that’s about it. Enjoy! Next articleAdd Zekrom or Reshiram to Your Pokemon Game this month.